Thanks to The Rock for identifying the ship as the tug John Roen IV. The tug was launched in 1947 and declared a total loss in 1976. 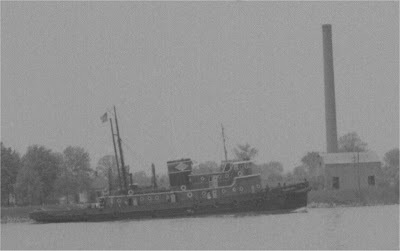 If you would like to see a color photo of the John Roen IV that was taken by John Vournakis in 1963, please click here. John Roen IV, tug out of Sturgeon Bay. Great to see you here! Thanks for the identification.